Poinsettias are widely known as the “Christmas” flower of Mexico. It is a popular potted plant. 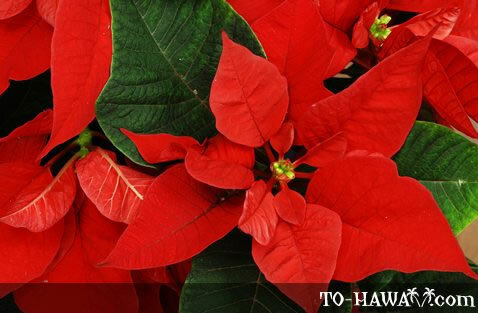 In Hawaii, poinsettia also grows in gardens and up to a height of 12 feet (3.7 m). It blooms from November through March. The scarlet poinsettias are the most common, but there are also white and salmon-colored ones. What looks like the flower is actually the colored leaves. The real flower is small and yellow-green colored.